Aspiring brewery owner Don Tedlock is a man with a plan. He's developed a brewing philosophy, talked to suppliers, chosen packaging and created mock-up designs for his labels and branding. Of course, this all probably sounds familiar, especially to current brewery owners or those thinking of opening one down the road. Where he intends to be different is in the beer. 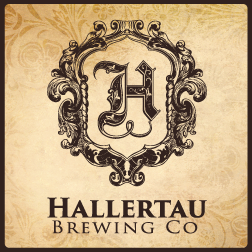 Hallertau Brewing Company, should it come to be, will focus exclusively on "big" beers targeting the craft connoisseur. Every product, whether it be a year-round offering, seasonal or one-off will be barrel-aged and have an alcohol percentage in the area of 10% or more. Tedlock is eschewing the craft beer starter kit (a blonde, a brown and a red) in an effort to create his own niche in the ever-expanding North Texas marketplace. Packaging will be in 750mL flip-top bottles, with labeling designed to be both classic and elegant. He's looking to tap into high-end establishments, with hopes that one day you'll be able to share a bottle of his beer in some of the area's more exclusive restaurants. Such places are generally known for their rich, culinary creations and he wants to provide options for pairing them with big, flavorful beers. What Tedlock doesn't have yet is a location. He wants to end up in the northern part of town, preferably near Frisco. Thus far, he's scouted sites along FM 423 on the city's western border. As for the beer, when I met with him a few weeks back he served samples from a number of test batches. Each is still a work in progress in terms of recipe formulation and style definition, but the most refined was his Baltic Porter barrel-aged on American oak. Needless to say, the brewery is still in the very early stages of development, but that's where you come in. Tedlock wants to know what you think. It's not just about whether or not you like the beer, it's also about whether or not you think he has a viable vision. Can a brewery focused solely on "big" beers make it in the Metroplex? Let him know your thoughts on Saturday, February 15, at Jack Mac's Swill & Grill in Dallas. He'll be there from 1-3 p.m. sampling four beers, answering questions and collecting your feedback.